Solstice nights have been filled with twilights, planets, and noctilucent clouds. Astronomers tend to curse the short nights and late sunsets of summer solstice. But the bright nights do offer unique sights. Over the last few nights I’ve set up at what I call “Solstice Pond,” a prairie slough near home ideal for shooting the aurora to the north and, at this time of year, the glow of twilight and noctilucent clouds. Below is the view on the night before solstice, looking north toward the glow of “perpetual twilight” that lights the northern horizon at solstice time from my latitude of 50° north. 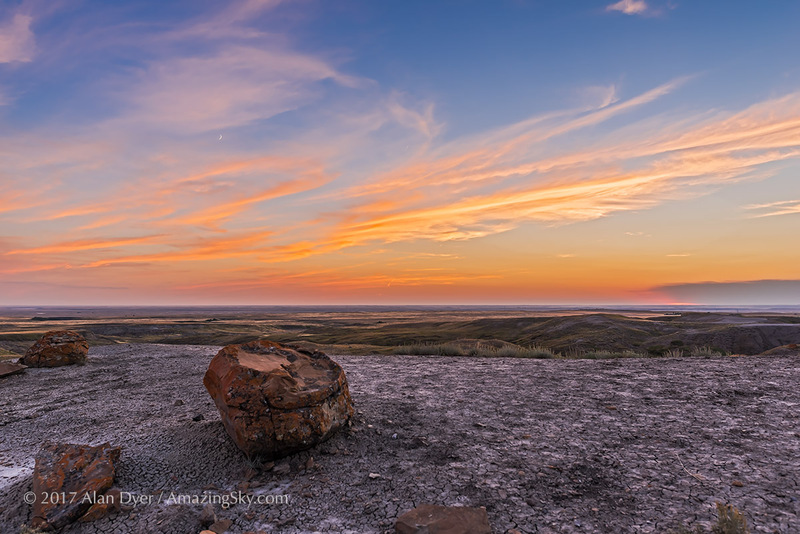 A 120° panorama of the summer solstice twilight (at 12:30 am local time) looking north over the prairie pond near home in southern Alberta, taken June 19/20, 2018. Some very faint noctilucent clouds are at left but fading, while some very faint rays of auroral curtains are also visible in the photo but were invisible to the eye. The bright star Capella is at centre and reflected in the calm waters. Perseus is at right of centre. The red lights at right are from the wind turbines at the Wintering Hills Wind Farm. 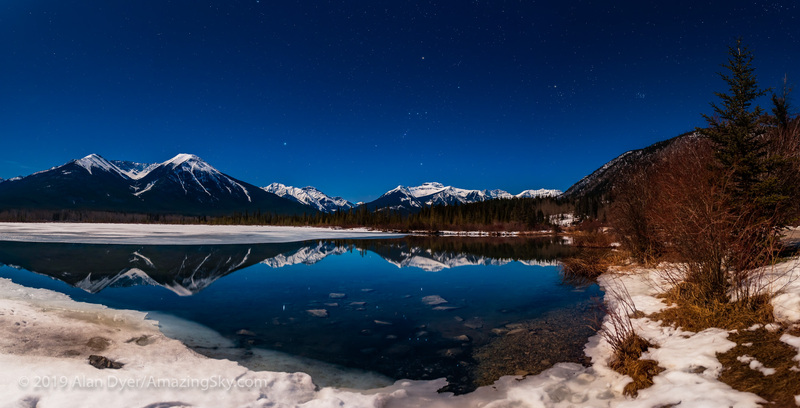 This is a stitch of 6 segments, with the 35mm lens at f/2.5 for 20 seconds each with the Canon 6DMkII at ISO 400. From farther north the twilight would be more prominent, while above the Arctic Circle at 66° N latitude, the twilight turns to full daylight as the Sun never sets. 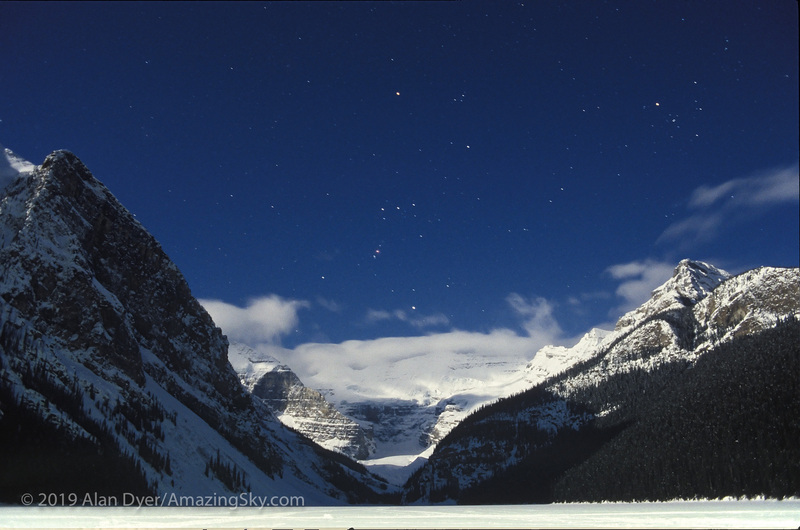 The view looking south this night, with the Moon just off frame at right, includes the Milky Way at centre, with Saturn embedded, flanked by bright Jupiter at right and reddish Mars at left, both casting shimmering “glitter paths” on the still waters. 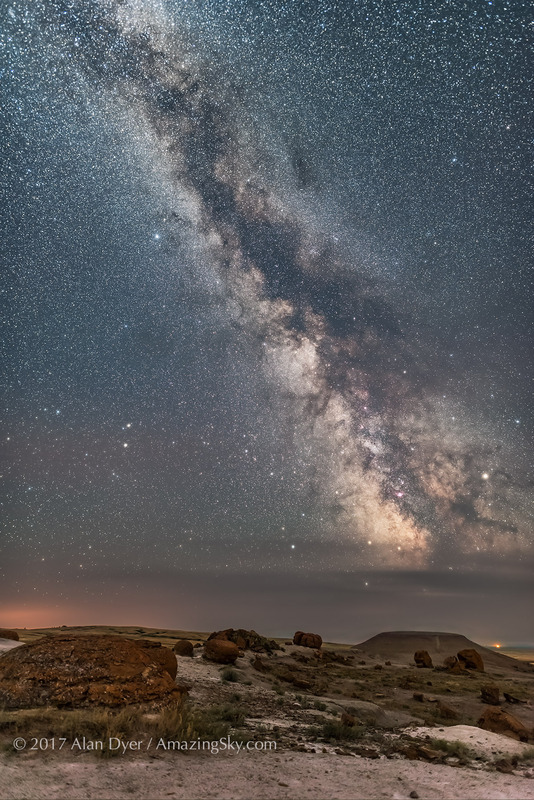 A 160° panorama looking south near summer solstice time in June 2018, with the bright planets Mars (left) and Jupiter (right) and their glitter paths on the water flanking the Milky Way and Saturn in Sagittarius above the pinkish Lagoon Nebula. The waxing Moon is setting off frame at right brightening the sky and lighting the landscape. The sky is also blue from the solstice twilight. The stars of Scorpius shine between Jupiter and the Milky Way. 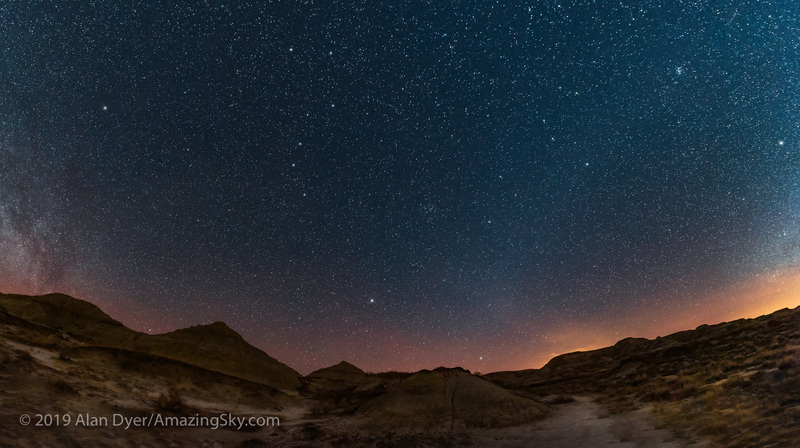 Some faint bands of red and green airglow are visible at left, despite the bright sky. 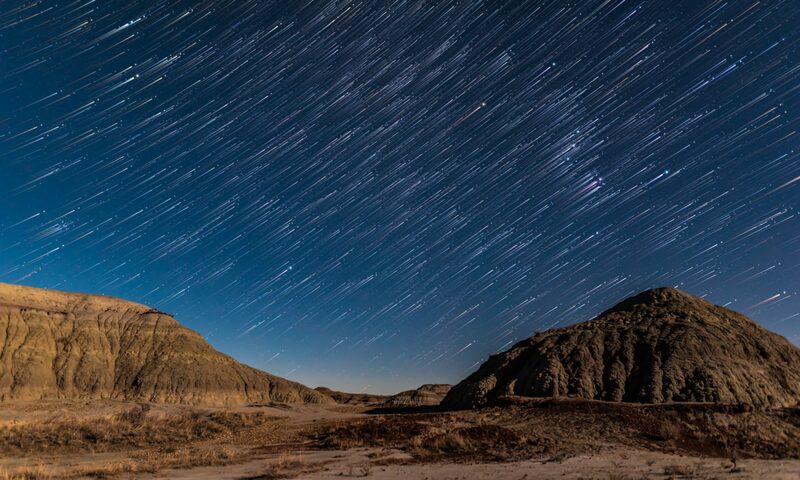 This is a stitch of 8 segments, all for 25 seconds with the 35mm lens at f/2.2 and Canon 6D MkII at ISO 800. A few nights later (below), on June 24, the star of the solstice sky put in an appearance. Bright noctilucent clouds (NLCs) shone to the north, reflected in the pond. These are water vapour clouds 80 kilometres high at the edge of the atmosphere – in the mesosphere – almost in space. They form over the Arctic in summer, and are high enough to remain sunlit even in the middle of the night as they catch the Sun shining over the pole. 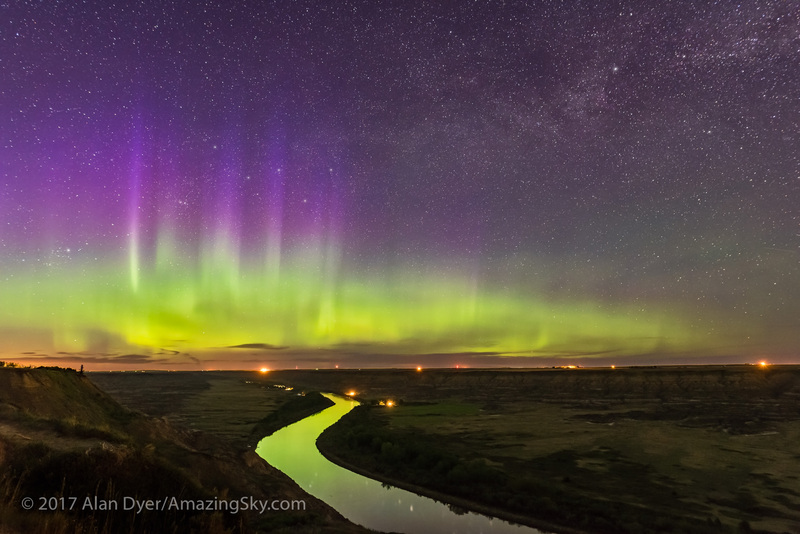 Southern Western Canada – the Prairies where I live – is well-placed to see them, as we are far enough north to see them in our sky, but not so far north that our sky is too bright. A fine display of noctilucent clouds (NLCs) or polar mesospheric clouds, reflected in a local prairie pond near home in southern Alberta. The display started with wisps much higher in the north but they faded as the Sun dropped lower, with the display at this extent by the time I reached my spot and took this panorama. Leo and Regulus are setting at far left in the west, as is Venus just above the horizon at left. Capella and Auriga are at centre, and circumpolar, while the stars of Perseus at right, rising. This is a panorama of 9 segments, at 15° spacings, with the 35mm lens at f/2.8 for 13 second exposures with the Canon 6D MkII at ISO 400. Stitched with Adobe Camera Raw. An even better display appeared two nights later, on June 26, brighter and with more structure. The curving arc of the top of the display defines the most southerly edge where sunlight is able to reach. That edge drops lower through the first part of the night, as the Sun itself drops lower below the horizon. This causes less of the NLC display to be sunlit. 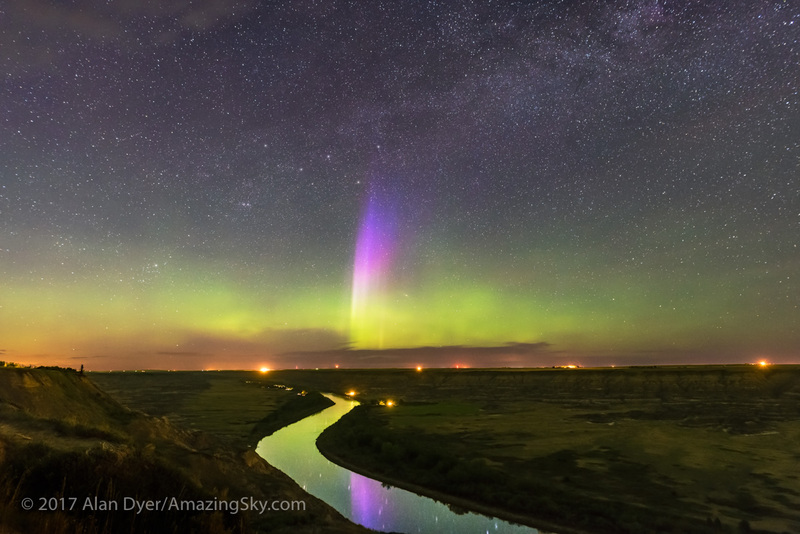 A panorama of a fine display of noctilucent clouds across the northern horizon over an angle of about 60°. This was on June 26, 2018 at about 11:45 pm. Capella is just left of centre. The display faded as the solar illumination dropped and the clouds darkened from the top down. This was from the small pond near home in southern Alberta. This is a stitch of 7 segments, each 2 seconds at f/2.8 with the 85mm Rokinon lens and Canon 6D MkII at ISO 400. Stitched with ACR. 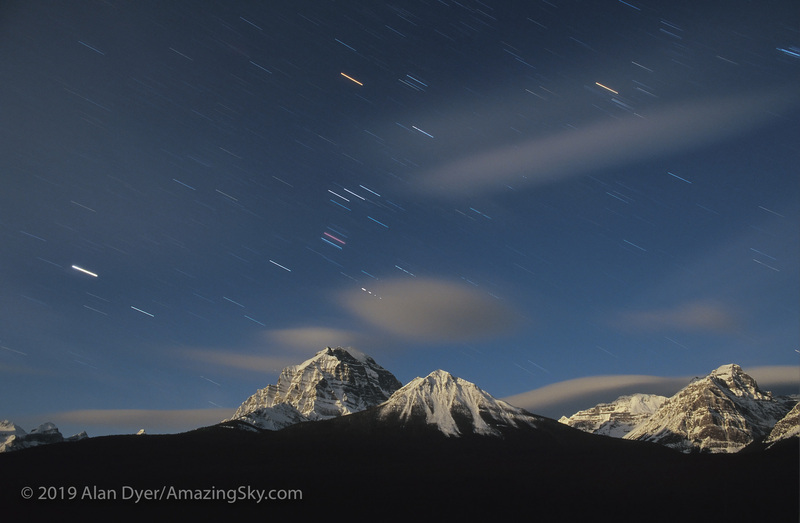 You can see this effect of the changing illumination of the clouds in this time-lapse compilation from June 26 (below). Also notice the waving motion of the clouds. It is as if the NLC material is flowing over standing waves in the atmosphere – and it is! The waves are called “gravity waves,” and are bumps in the high atmosphere created by disturbances far below in the normal layers of the atmosphere, the stratosphere and troposphere. The video includes two clips shot simultaneously: from a camera with a 24mm wide-angle lens, and from a camera with an 85mm moderate telephoto. Expand to view full screen in HD. The motion, here over an hour or more, is hypnotic. The NLCs move right to left (east to west), while the dark normal weather clouds on the horizon are blowing left to right (west to east). The stars are also turning left to right. The water ripples in the wind, while ducks swim by. It was a magical night at Solstice Pond. The sky looks very different from down under. 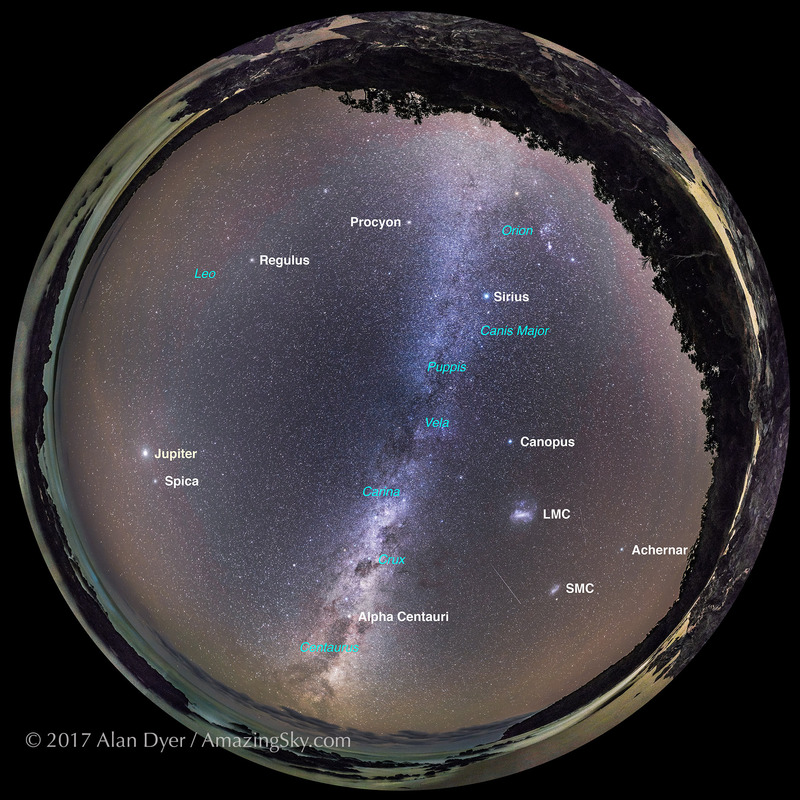 This is the entire sky of early evening as autumn begins in the southern hemisphere. 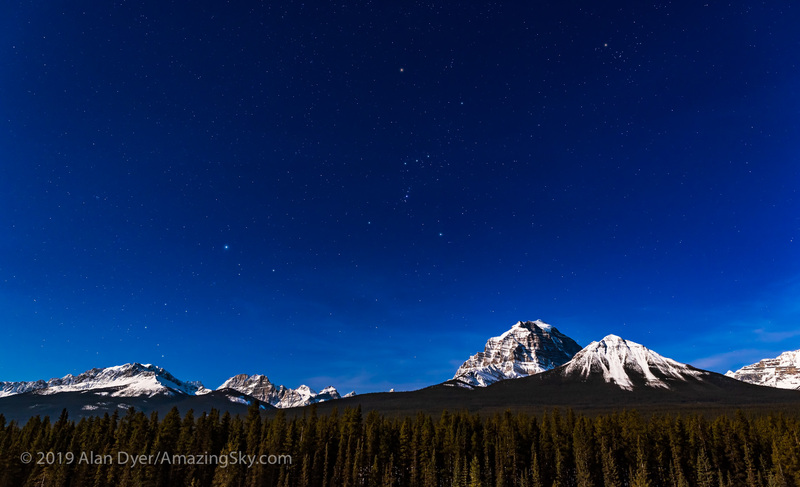 My last post showed Orion and the winter sky disappearing into the west, from home in Alberta. This post shows that same area of sky (here at top) also setting into the west. But that’s the only area of sky familiar to northern hemisphere stargazers. Everything below Orion and Sirius is new celestial territory for the northern astronomer. Welcome to the fabulous southern hemisphere sky. And to the autumn sky – From home it is spring. From here in the southern hemisphere summer is giving way to cool nights of autumn. Straight up, at centre, is the faint Milky Way area containing the constellations of Puppis and Vela, formerly in the constellation of Argo Navis. Below, the Milky Way brightens in Carina and Crux, the Southern Cross, where dark lanes divide the Milky Way. At right, the two patches of light are the Large and Small Magellanic Clouds, satellite galaxies of our Milky Way. 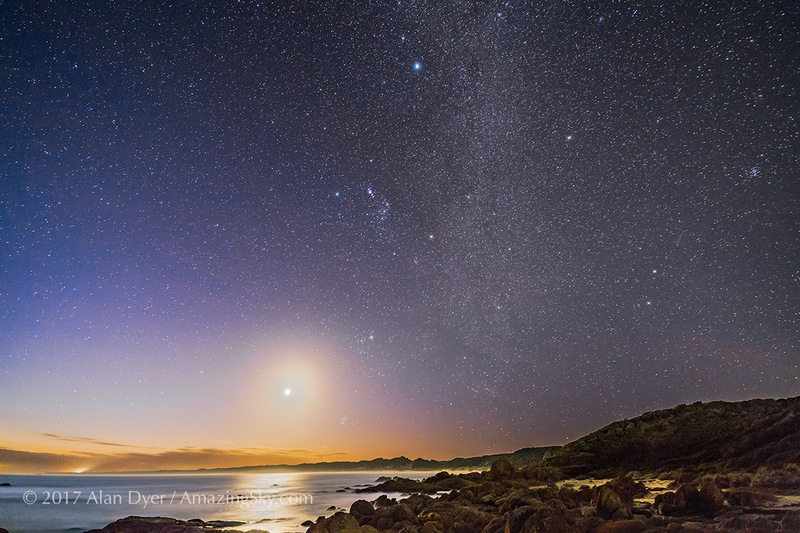 The bright object at left is Jupiter rising over the Tasman Sea. I shot this 360° panorama on March 31, 2017 from Cape Conran on the Gippsland Coast of Victoria, Australia, at a latitude of 37° South. I’ve turned the panorama so Orion appears as we’re used to seeing him, head up and feet below. But here in the southern hemisphere the image below despicts what he looks like, as he dives headfirst into the west in the evening twilight. The bright object here is the waxing crescent Moon, here in Taurus. Taurus is below Orion, while Sirius (the bright star at top) and the stars of Canis Major are above Orion. This view above takes in more of Canis Major. Note the Pleiades to the right of the Moon. 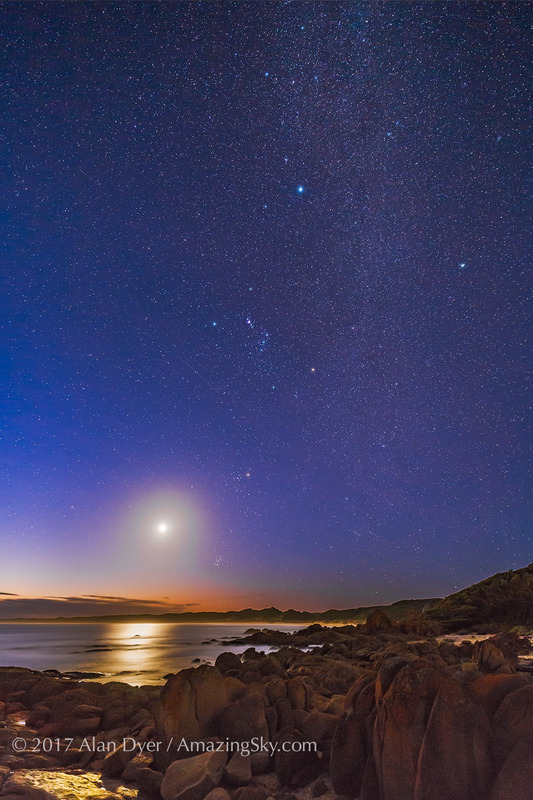 Visiting the southern hemisphere is a wonderful experience for any stargazer. The sky is disorienting, but filled with new wonders to see and old sights turned quite literally on their heads!